The following pages are a tour of the past and some of the very fun days at my store. so many wonderfully talented artists and friends. I plan to add more stories and photos to these pages as time allows, so this section will be growing! In 1988, shortly after the band cut the 1st hugely beloved album, which became an instant classic, they decided to make some music videos and I provided about a dozen instruments and small amps which show up in the bands video's. Tom really liked playing my Danelectro Longhorn 4 string Bass and many other items of mine are sprinkled around the sets of the 2 video's. I believe the Martin 12-string acoustic that Bob is playing is Tom's D-28-12. When you watch and listen to these songs, it's hard to fathom that much talent all in 1 room let alone all on the same album... these are 1 of a kind moments that can never be repeated! above: A fabulous photo from the Traveling Wilbury website that was released from the filming of the Video. 3rd verse, the camera scan's his Photo and there is a Guitar that is still "rocking" away in a chair, an homage to Roy, who had an amazingly beautiful, unique and instantly recognizable voice, he was an Original! Tom is plucking away on my Danelectro Longhorn again, Jeff plays my Black Danelectro Bass VI and Bob is strumming my ES-175. The great Jim Keltner is on drums in both video's and the recordings, making it impossible to listen to these tracks and not feel the grooves! these dedicated & talented artists have done is STELLAR! left: This is a very festive embroidered art, iron-on jacket patch that someone in the band gave me back in those days. I always wanted to apply it to a Levi's jacket but I eventually misplaced it and recently came upon it again in a box of stuff that I found after several home relocations. This guitar pick was owned and used by the late Roy Orbison who portrayed "Lefty Wilbury" in the band. Jackson was playing a vintage Teisco Del Rey that I gave him. The next time I saw him, I think I had gone to his legendary Santa Monica studio (Groovemasters), and there he surprised me with a gift of a Tour T-shirt (see below photos). 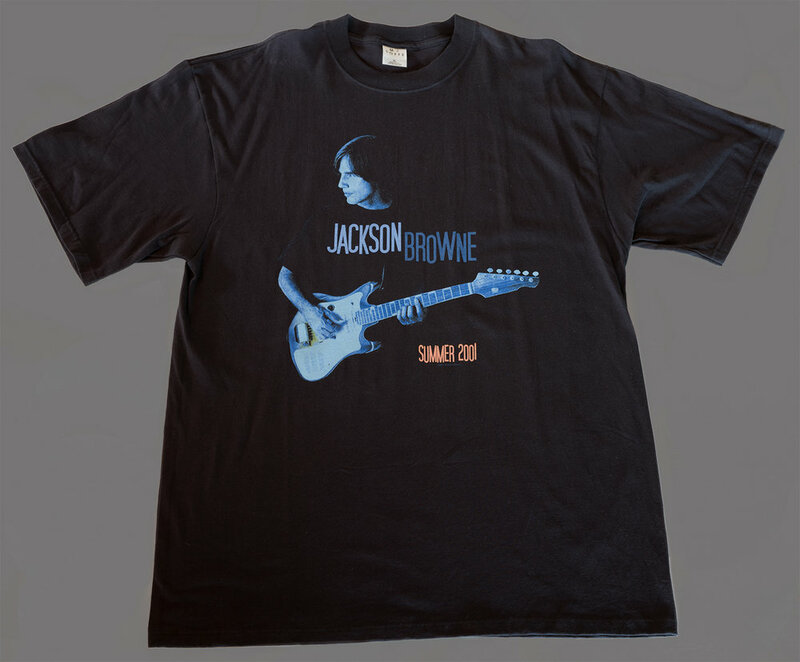 I was really surprised to see that my little Teisco Del Rey guitar had become a usable instrument and the "poster child" for 1 of the Tour merchandising shirts! To see what Jackson is up to, and it's always something fun, be sure to visit his WEBSITE. with Cherry finish that she acquired from me back in the mid 1990's. ...the bass never looked as good as it does here! Another nice image of Sheryl performing live on the bass. Sheryl is a multi-talented Artist.... and she always looks amazing! ...looks like big fun jamming with Keith! Sheryl released another great, long-awaited CD in 2017.